Bayesian epistemology offers a powerful framework for characterizing scientific inference. Its basic idea is that rational belief comes in degrees that can be measured in terms of probabilities. The axioms of the probability calculus and a rule for updating (e.g., Bayesian conditionalization) emerge as constraints on the formation of rational belief. Bayesian epistemology has led to useful explications of notions such as confirmation. It thus is natural to ask whether Bayesian epistemology offers a useful framework for thinking about the inferences implicit in the validation of computer simulations. The aim of this chapter is to answer this question. Bayesian epistemology is briefly summarized and then applied to validation. Updating is shown to form a viable method for data-driven validation. Bayesians can also express how a simulation obtains prior credibility because the underlying conceptual model is credible. But the impact of this prior credibility is indirect since simulations at best provide partial and approximate solutions to the conceptual model. Fortunately, this gap between the simulations and the conceptual model can be addressed using what we call Bayesian verification. The final part of the chapter systematically evaluates the use of Bayesian epistemology in validation, e.g., by comparing it to a falsificationist approach. It is argued that Bayesian epistemology goes beyond mere calibration and that it can provide the foundations for a sound evaluation of computer simulations. This chapter has benefited from helpful comments by Seamus Bradley, interesting critical suggestions and comments by Nicole J. Saam, and an extensive and extremely valuable commentary by Stephan Poppe. Thanks to all of them! Bayarri, M. J., Berger, J. O., Higdon, D., Kennedy, M. C., Kottas, A., Paulo, R., Sacks, J., Cafeo, J. A., Cavendish, J., Lin, C. H., & Tu, J. (2002). 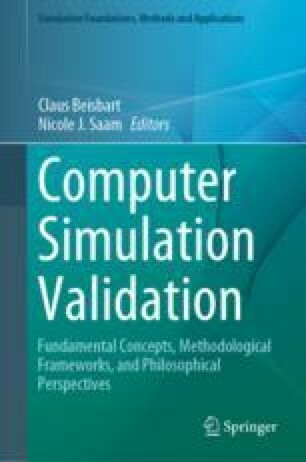 A framework for validation of computer models. Tech. rep. Obtained from http://citeseerx.ist.psu.edu/viewdoc/summary?doi=10.1.1.125.7166&rank=5.